Salmon Steak with Cherry Tomatoes and Capers is a yummy meal that will kick your taste buds. The spiciness of capers and the delicacy of the cherry tomatoes perfectly enhance the aroma of the salmon. Cooking yummy salmon has never been easier! Wash and cut the cherry tomatoes in halves. In a large skillet, heat the oil and quickly saute capers and chopped garlic. After one minute add the tomatoes and, stirring continuously, stir fry for one minute. Lay the salmon steaks in the pan, surrounded by the tomato and capers sauce. Season with thyme, fennel seeds, salt and pepper and let cook, covered, for about 5 minutes. Carefully flip the salmon steaks and let cook the other side for additional 5 minutes or until the inside is lightly pink. Stir from time to time to avoid the caper and tomato sauce to stick to the pan. 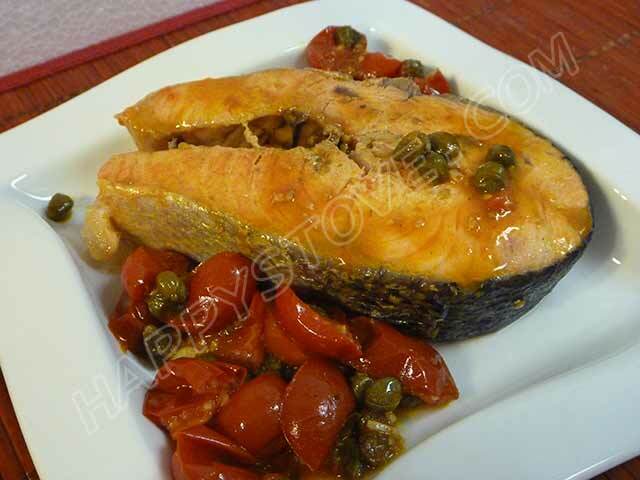 When the salmon is ready, transfer on serving plate and top with the tomato and caper sauce. Serve hot.